We are now taking bookings for hire of the Pavilion (subject to availability) - For more information see here. Welcome to the East Dean and Friston Parish Council website. We hope that you enjoy browsing it and finding out more about our village and its council. We always welcome feedback from our site visitors, so if you have any comments or suggestions for improvements then please let us know via the "Contact Us" link. Changes to bus services in Eastbourne Borough: April 2019 update - click here for summary document. SAVE THE DATE NOW! - This year's Annual Village Meeting will take place on Friday 17th May in the Village Hall. For more information click here. NHS Survey - Your input is needed. The public are being asked for their views about how health and care services could be improved. The deadline for completion of the survey is 30th April 2019. For further details see here. Are you a village club, society or support group that needs financial support? The Parish Council grant scheme is now open for applications until 30th April 2019. If your group has not already been contacted, or to find out more about the scheme click here. The minutes for the Parish Council meeting, held on 4th April, can be viewed by clicking here. If you're in a hurry then you can view a summary of the minutes from the last three months by clicking here. The minutes of the last Planning Committee meeting, held on the 19th March, have now been published and can be viewed here. The Neighbourhood Plan Steering Group held its second meeting on 21st March 2019 and the minutes of that meeting can be found here. More information on this group can be found by clicking here and the minutes of the inaugural meeting of the group can be found here. Did you know that the Parish has its own Tree Warden? Peter Williamson is available to provide advice and information about trees and hedging, including for planning applications and plant health. To find out more about Peter and the service he provides please see here. The Parish of East Dean and Friston is located between the south coast towns of Seaford and Eastbourne, situated on the southern edge of Wealden District in the County of East Sussex and within the South Downs National Park. It is a relatively large rural area , comprising the village of East Dean and Friston, together with the smaller hamlets of Birling Gap and Crowlink. The A259 main coast road passes through the Parish with the old village to the south and the newer parts of the village (known as the "Downlands Estate") to the north. The Parish is primarily residential, covers an area of 3.3sq miles and consists of some 760 households with a population of around 2,200. 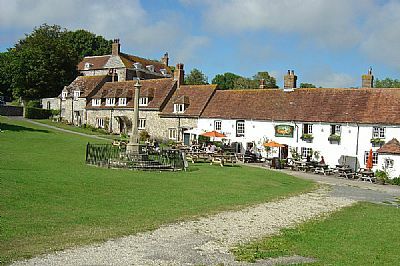 East Dean Village is centred around the Village Green with its war memorial, medieval church and long-established inn, “The Tiger”. To the North-West of the village, as the A259 ascends Friston Hill, is the area known as Friston, which was originally a separate village with its own church at the top of the hill. 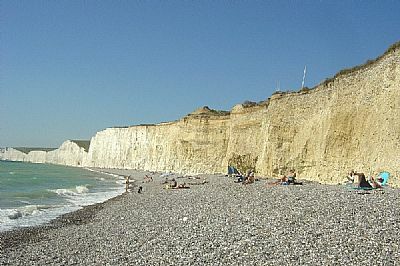 Birling Gap is a coastal hamlet with a long shingle beach, backed by the famous Seven Sisters cliffs and not far from Beachy Head. The Birling Gap visitor centre and cafe, and some of the surrounding land is owned by the National Trust. Crowlink is a small hamlet grouped around a manor house; in the 18th century it was a haven for smugglers of Gin that became known as "Genuine Crowlink". It was also once the home of the Edwardian author, Edith Nesbit, whose best-known work is “The Railway Children”. Parish Councils were formed in England under the Local Government Act 1894 to take over local oversight of civic duties in rural towns and villages. Before this date a variety of groups based around ecclesiastical (church) parishes had responsibility for these matters, in a system of local government that originated in the feudal system of the 8th century. The establishment of Parish Councils effectively separated church from state and today's councils are totally secular in nature and independent from the Parochial Church Councils that deal with the administration of the local Church of England places of worship. 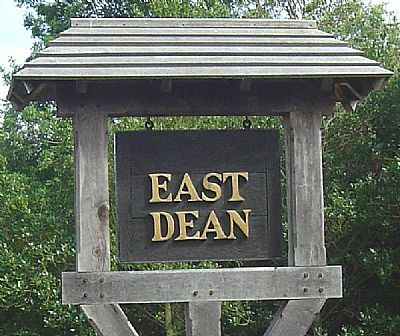 Following the 1894 Act, both East Dean and Friston began Parish Meetings (not council meetings) and East Dean then formed a Parish Council in 1924. The Friston Parish Meeting merged with East Dean to form the East Dean and Friston Parish Council in 1948. Parish Councils are the first tier of local government and have limited variable tax raising powers. The component part of the Council Tax, which comes to the Parish Council, is known as the Precept. Parish Councils are responsible for areas known as civil parishes, and there are approximately 9,000 Parish Councils in England. East Dean and Friston is one of those civil Parishes. Although there is nothing to prevent Parish Councils being political in nature, the current East Dean and Friston PC members are all independent of any party political sponsorship. The current Parish Council was elected in 2015 and is due for re-election in May 2019.